AMES, Iowa – Iowa dairy producers have the opportunity to learn about emerging dairy industry issues at the 2018 Dairy Days hosted by Iowa State University Extension and Outreach specialists. The program is scheduled at seven eastern Iowa locations between Jan. 15 and Feb. 1. Bentley said the day-long program offers producers an opportunity to hear up-to-date information and provides time to talk with speakers about specific individual situations. Alternative Forages for Dairy Cows – What else is there besides corn silage and alfalfa? Common Feed Additives for Dairy Cows – What are they and what do they do? 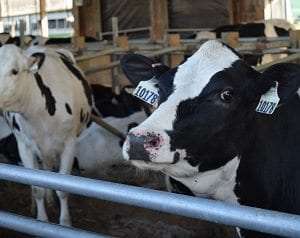 Dairy Days will be offered at seven Iowa locations. Registration starts at 9:30 am and the program will conclude by 2:30 p.m. A $15 registration fee covers the noon meal and proceedings costs. Pre-registration is requested by the Friday before each event to reserve a meal. Vouchers for the event may be available at your local agri-service providers or veterinarian’s office. For more information, contact your county ISU Extension and Outreach office or a dairy specialist – Jennifer Bentley at 563-382-2949 or Larry Tranel at 563-583-6496.